The PlayStation 3 gets an option 3.15 update on December 17th, adding the ability to transfer data between two consoles as well as making PSP minis playable on the PS3. The rumors were true after all. 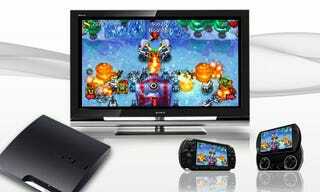 Update 3.15 will make the PSP mini emulator run on the PlayStation 3, allowing you to play your bite-sized games on a much larger screen...which I suppose you could already do by hooking up your PSP to the television, but it's all about a seamless experience, right? Having recently purchased a PSPgo myself, I've browsed the minis section quite often, in the same way one might stand in front of a fridge filled with moldy food, wondering if they really are that hungry. The update also adds PS3 data transfer functionality, giving those upgrading to a newer model the ability to connect two consoles via a LAN cable and swap data, which would have been incredibly handy for me four months ago. Soooo. Did we mention Yakuza 3?